The perfect Sunday evening supper, this basic stew is pure comfort fare! What I enjoy particularly are the ease of preparation, large chunks of chicken, and the light yummy gravy. 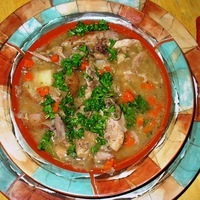 Based on a recipe from Taste of Home Magazine, this recipe uses boneless skinless chicken thighs. I have used a meaty turkey thigh in place of chicken: just remove the skin and cut into large chunks around the bone. After cooking, remove meat from bone completely. Place potatoes, onion and carrots in a 3-quart crock pot. Sprinkle with flour, garlic, thyme, Italian seasoning, salt and pepper; toss slightly to coat. Place chicken pieces over top and tuck bay leaves down on each side of pot. Add broth, cover and cook 7-9 hours or until chicken and vegetables are tender. Ladle into serving bowls and sprinkle with fresh parsley. Looks fantastic: looks colorful, and sounds tasty and balanced. I enjoy stews, though I love beef most, chicken is second best.